How fun! Thanks for sharing Greg! Inge, I love your booties!!! Oh my goodness, what wonderful photos! It looks like you're having beautiful weather (and I hope it holds up). Gorgeous gals and scenery. I hope you three enjoy some much deserved R&R. Cheers! I am having SO much fun with my dear sweet friend Inge - I can barely stand it. It's like having special family over at the Cox Castle. We will really miss her when she has to go back to Belgium. 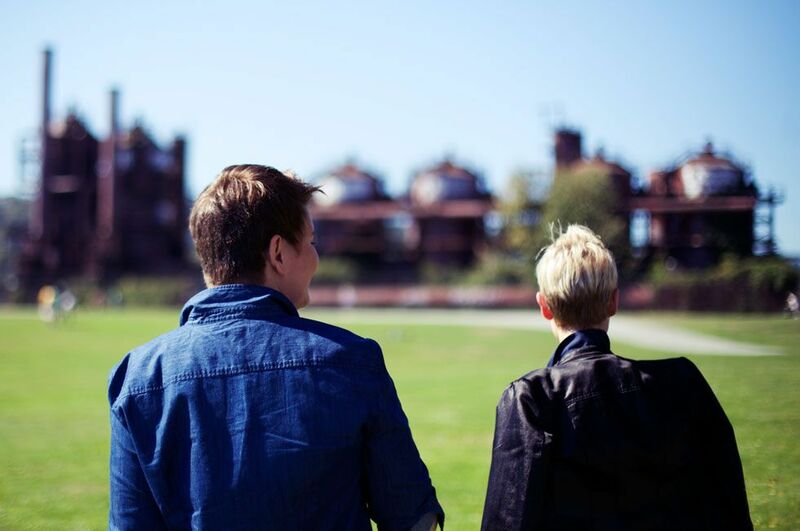 We love Gasworks Park too, Anna and Diana. Oh, beautiful ladies in a beautiful place! Thank you for sharing these. I am sure you're all having a marvelous time! So fun to see the gorgeous ladies having a lovely time. Inge you have a beautiful smile! Gorgeous photos, Greg, and how lovely to see the two Urban Princes on the town! I so wish I could join the fun this time. You two look gorgeous! Looks like a wonderful place. Greg ,your photos are almost like being there. Inge and Angie, two beautiful women in beautiful Seattle. Can it get any better? 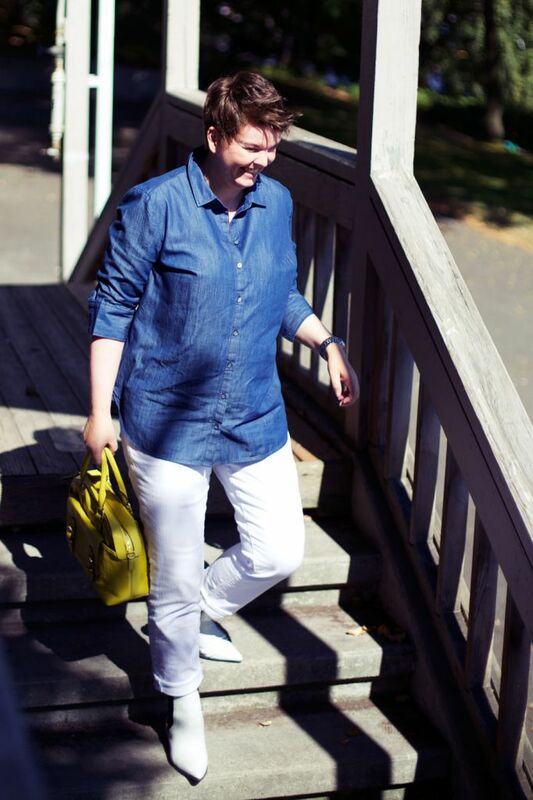 Great photos, so glad we're still hanging on to summer a bit for Inge. Enjoy the week! So fun! The weather has been perfect. What a beautiful day! The photos are gorgeous, and look how stylish Inge and Angie look in their white jeans. Can't wait to meet Inge this weekend! Thank you for the very sweet words everyone. 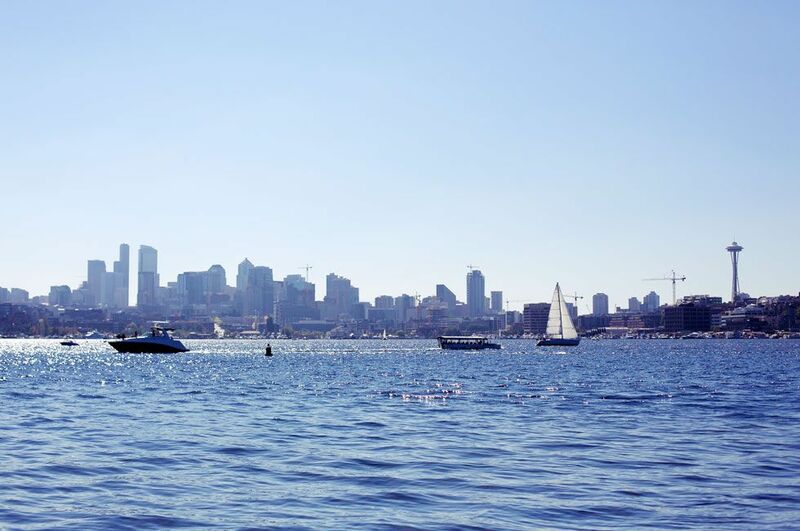 This is my first time visiting Seattle, and I am just completely blown away by how beautiful the city is. I absolutely love the combination of all the hills, water and stunning trees. (the wood houses are amazing too). There's so much to see and do and taste (lots of delicious food here as well:-), and all the exploring is incredibly fun. I am having an absolute ball with Angie and Greg. They are spoiling me rotten and I definitely feel like a Princess at the Cox Castle. Thanks for taking these beautiful photos, Greg! 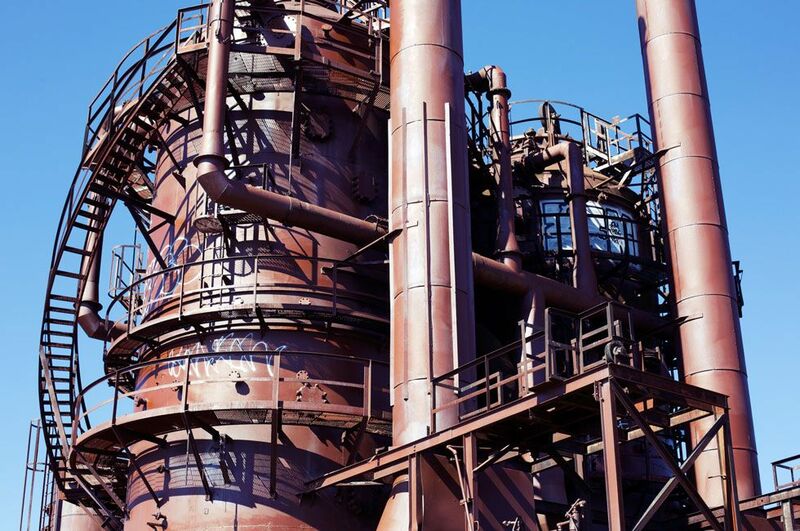 Gasworks Park is a stunning location for sure. P.S. Greg, the photo of Inge descending the stairs reminds me a little of a papparazzi photo of a celebrity. It's got that distance to it, and she's not looking at the camera. 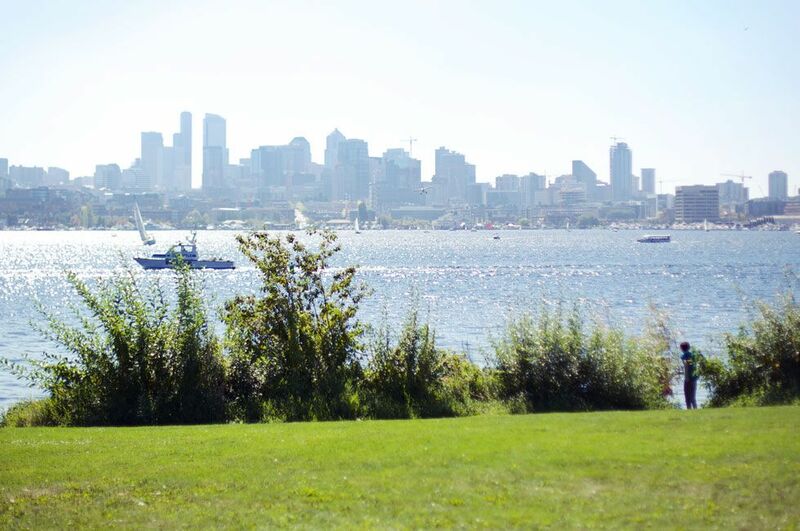 Our own celebrity spotted at Gasworks Park--he hehee. Gorgeous photos of gorgeous women! Lovely to see such sights (and nice scenery too) Rock on with your white jeans and booties ladies! the setting and the subjects are beautiful! thanks for sharing the pictures with us! have a great visit, and enjoy the wonderful meet up this weekend. Great pics Greg! I hope you continue to Enjoy your time together and I also hope the weather stays so nice! 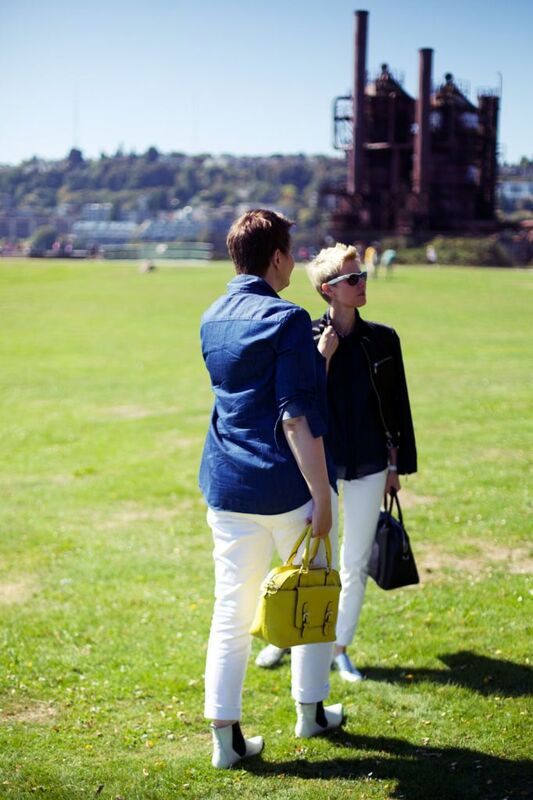 You two are taking Seattle by storm in your fab white jeans and booties! Go YLF friends and colleagues! Greg, you are lucky to have these two gracefully gorgeous women around you. The style of outfits is so chic and modern. White jeans and booties fabness X 2. Thank you for sharing the pics. What fantastic pictures! Enjoy your time together! Beautiful pictures! Hoping you all have a blast! What an interesting setting. Wonderful to see the " two lovelies " together enjoying their visit. Beautiful photos of beautiful women! White jeans, chic handbags, white ankle boots--I imagine there were some turned heads that day! The joy and friendship are palpable in the pictures. Yes, thank you for sharing. Have a lovely time! Beautiful pictures! Inge, your hair looks fantastic!!!!! Thanks for the photos, have fun with Inge! Gorgeous all around! Enjoy your time. The weather has been truly fantastic for sure. It looks like we are heading into Fall now, but that’s perfect too because the Autumn foliage is absolutely stunning in Seattle. Columbine - Thank you so much. Oh Sharan, you cracked me up with your papparazzi comment:-) And I can’t wait to meet you too! Lyn67, Laura, and Shannon - You sweet ladies make me smile. Viva - Thank you so much!! I am just so thrilled with my new ‘do. Thanks again for all the super sweet comments everyone, I wish you could all be here with us. How awesome !!! Have fun everyone. What beautiful and fun photos! Glad to hear you three are enjoying your time ^^ Love the second photo especially. Everything looks great and sounds even better. Thanks for the sweet comments, ladies. Inge, Greg and I are having a ball. Lots of shopping, sight-seeing, eating out, cooking at home, meeting friends, watching movies, and yakking till the cows come home. Plus we're throwing in the yoga, long walks and photography classes. Inge is one of the sweetest and most fabulous people I know. A gem deluxe. Fantastic to see you lovely ladies out and about - thank you Greg for the pics! From the looks of it Inge, it seems you have fully recovered from any jet lag - must be the pampering at Cox Castle! Wonderful photos! Angie and Inge look beautiful and happy. I hope you guys have a really great time... Thanks for the update! Aida - I think it would be so funny and fab if Angie and you ended up being outfit twins this weekend. Merwoman - Oh absolutely, it's all thanks to Angie and Greg spoiling me rotten. I am being treated like a Princess at the Cox Castle! Sarah - We are having a ball! Angie - You are making me blush!